Have you ever felt like you are experiencing events that have happened before, like things are so familiar you know what is going to happen? That sensation is known as Deja Vu. Imagine if that feeling happened constantly over a short span of time, and when that span of time was over everything restarted in exactly the same way. This is essentially what happens to Link in Majora’s Mask. We can understand how it feels from his point of view and can get an idea of how it feels for the other people in the game as well — they should be unaware that events are happening over and over. There is one however who doesn’t seem to be effected by time: The Happy Mask Salesman. Why exactly is he different than other characters? Could he be centered around a plot mistake? Touching on themes about time travel mistakes is not uncommon as various forms of literature and entertainment have shown, and this is exactly what I intend to find out. If I have piqued your curiosity, join me past the break. Time is a very important thing to us. We are all in fact oriented in time. At some point or another in our day we start keeping track of time, to work our daily routines around it. We wonder, when should we leave to go somewhere, and will we be late if we don’t leave early enough? Might there be a faster route which detours us past traffic, crowded streets, or bumping into familiar people? Could we get through those detours but still be on time? These are probably just a few questions we have all thought about on a busy day, and don’t we sometimes wish we didn’t need to worry about those things? That somehow we could harness time to our advantage? Its interesting, the possibility of time travel; with it we could get through our days faster, spend more time in a good moment, even go back to fix mistakes in the past. Doesn’t that all sound so convenient? It certainly would make things so much easier, but in order to do this we would need to bend the laws of time, which is impossible with our current technology. The laws of time are strict. There are two fundamental laws: one being, we are all rooted firmly in the present, and two, that time only flows in one direction (forward). As far as we know, there is no way to harness time to go back or forward into itself with the known technology we have today. Its still fun to ponder though; what might happen if one were able to travel through time? In general the concept of time travel is hard to grasp, it is even harder to imagine what different scenarios traveling through time could create. If one were to go into the past, and interact with people from that period in time, how might that change the course of history there after? These are when scenarios such as paradoxes, and the butterfly effect begin to come into play. A paradox is a scenario which defies logic, but theoretically might be true. Time travel in itself can create paradoxes. The Butterfly effect is a theory which states that ones actions, no matter the scale, will escalate and have a big impact at some point afterward. There is no denying that these themes are very popular, we often see such themes in books, movies, and in video games. Popular books include “Rip Van Winkle”, “The Time Machine” and “A Christmas Carol”, while movies include “Back to the Future”, “Groundhog Day” and “Terminator”. It should be noted, that with such themes mistakes can often arise, some which might even slip past the authors, directors, or developers. For example, in the movie “Back to the future” the main character of the movie, Marty, goes back in time. In the “past” he interacts with his parents while they were young which alters the way they were supposed to meet — Marty’s mother doesn’t fall in love with his father the way they were supposed to. In order to keep himself from being eradicated from existence Marty dons the identity “Calvin ‘Marty’ Cline” and plays matchmaker for his parents. He successfully gets them to fall in love and in the process plays a big role in their lives. The inconsistency is that once Marty is actually born and as he grows up wouldn’t his parents notice that he looks just like the man who encouraged them to get together back in high school? This is a rather small plot mistake, but it just goes to show that mistakes can, and probably will happen. So could this be what Nintendo did in Majora’s Mask? Did they make a plot mistake that just so happened to revolve around the Happy Mask Salesman? 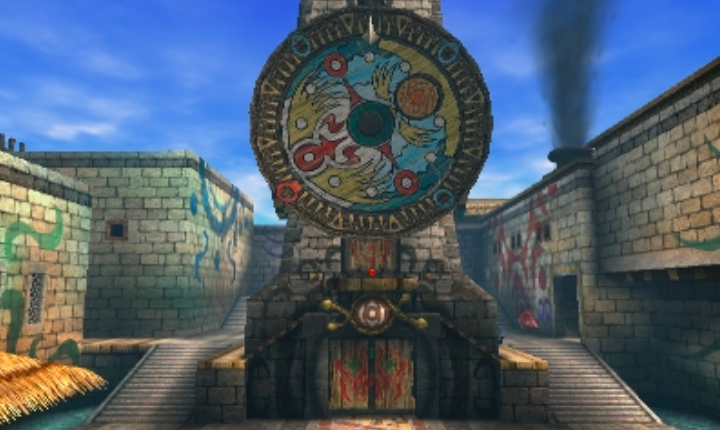 With the release of Majora’s Mask 3D fans of old and new are experiencing one of Nintendo’s takes on time travel. Recently, I have been replaying the remake when something came to my attention. 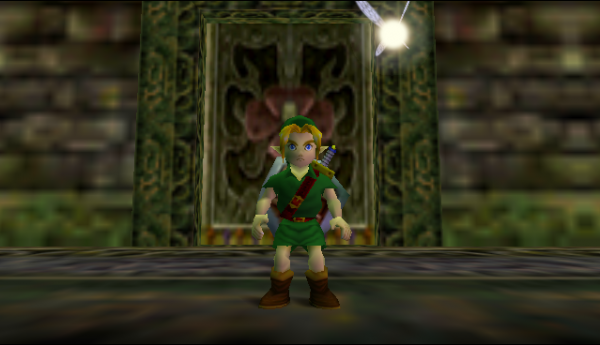 I was inside the Clock Tower after playing the Song of Time and once I freed the first giant in the game. I walked over to the Happy Mask Salesman and talked to him, and he seemed to remember too much — he happened to remember teaching Link the Song of Healing. The question which arises from this is; how does he remember teaching Link the Song of Healing? He really shouldn’t, as we learn from the flow of time in the game. At the beginning of the game, in the Clock Tower, the Happy Mask Salesman gives Link the three-day deadline. However, time only begins to flow normally once Link steps outside the tower; could this have something to do with the Happy Mask Salesman? Every time Link plays the Song of Time, he ends up right back at the very moment when he walked out of the Clock Tower for the first time. Before Link walks out of the tower, he makes a deal with the Happy Mask Salesman — this is at the beginning of the game. Here is the quote from that encounter. Link accepts the deal, he is hardly in a situation not to, after all. When Link eventually gets the Ocarina of Time back he plays the Song of Time which takes him back to the moment right when he first walked out the Clock Tower and the three day cycle began. During Link’s second visit to the Clock Tower, the Happy Mask Salesman teaches Link the Song of Healing. Inevitably, Link has to eventually play the Song of Time to advance the quest. Consequently that would bring Link back to the first day, so in theory, The Happy Mask Salesman should have no recollection of teaching Link the Song of Healing or turning him back to his Hylian form. However, in such circumstances if you return to the Clock Tower, he should ask questions such as, “How did you lift the curse?”, “Did you get your Ocarina back?”, or “Why are you no longer a Deku scrub?”. Instead he acts quite normal, and asks were Majora’s Mask is. The only reason Link and Tatl retain memories is because they are the ones actually time traveling. Every time Link walks inside the tower, the extent of the Happy Mask Salesman’s knowledge should be the original deal he and Link made before the three day timer even began. Also in his mind the whole event should have happened really fast, Link theoretically was only outside for a few seconds to the Happy Mask Salesman, yet he walks in with the Ocarina, and is human, not a deku scrub. The Happy Mask Salesman should then be flustered at this, yet he acts like nothing is strange — it’s like he is actually oblivious to the changes. There are only two explanations. Either it was a mistake that Nintendo let that slip past them at the time, or it was no mistake at all. Afterall, some say the Happy Mask Salesman is not an ordinary mask salesman; could this just be more proof of this? Let’s say it wasn’t a mistake, that would only mean the Happy Mask Salesman is no ordinary being. He does seem very strange. He claims to be a Mask Salesman, and says he is there on business, yet not once does he leave the Clock Tower. In Termina the Carnival of Time will be happening very soon, he should be out selling masks, shouldn’t he? It would be a perfect time for someone of his profession to be selling things. He gave Link only three days to get Majora’s Mask back, and it just so happens that in three days time, Termina’s moon will fall. Is that just a coincidence? 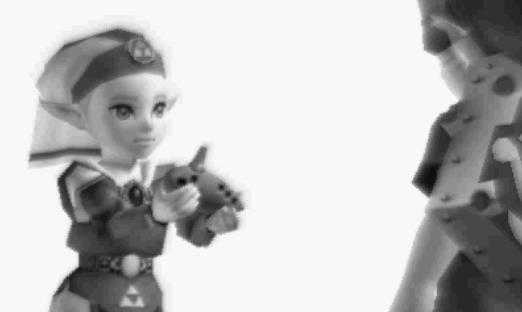 He claims nobody knows Majora’s Mask’s true powers, but he tells Link the mask’s power almost spot on before that! He says when he finally got the mask he could, “sense the doom of a dark omen brewing”, but he still kept the mask anyway instead of resealing it! There is definitely more than meets the eye with this man. He is possibly immune to the effects of time, maybe that is why time freezes in the Clock Tower. Of all places where time could freeze, it is where he is. This sort of null field in the tower might be what keeps him from forgetting things, even when Link restarts time. If all of this were true, if the Happy Mask Salesman really isn’t normal, then this just raises more questions. 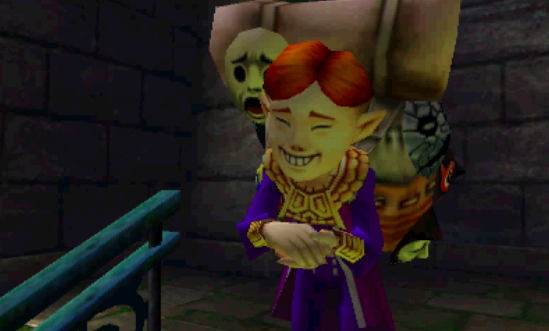 How did a mere imp best him to get Majora’s Mask? If he was so powerful why couldn’t he get the mask back himself? Was it all maybe orchestrated by The Happy Mask Salesman? If so, what for? Was it all just a game to him, or did he maybe do it for a purpose? Maybe the question we should be asking is if there can ever be any justifiable reason to jeopardize lives in such drastic ways. Is the Happy Mask Salesman a good guy, or has he been a villain all along?